By Michael Jackson. Arranged by Andrew Wrangell. Individual Part, Solo Part. 6 pages. Published by Andrew Wrangell (H0.230359-64450). Beat It is from Michael Jackson's album Thriller, released in 1983 as Thriller's third single. The music video features two rival gangs. Beat It was awarded a Grammy Award for best male rock vocal performance and two American Music Awards. Fun fact! Eddie Van Halen, the legendary guitar player, recorded the guitar solo for Beat It. He first thought he was receiving a prank call when he was contacted by the producer, Quincy Jones. While recording the guitar solo, the engineers found that the monitor speaker in the control room had caught fire, so the engineers said "this must be really good!" Another fun fact! Thriller is the best-selling album of all time and every song on the album was a number one hit. There is also a "Weird Al" Yankovic parody of the song called "Eat It". Beat It has also been covered by Pierce the Veil, Fall Out Boy, Pomplamoose, Justin Bieber, Fergie, John 5 and Eminem. 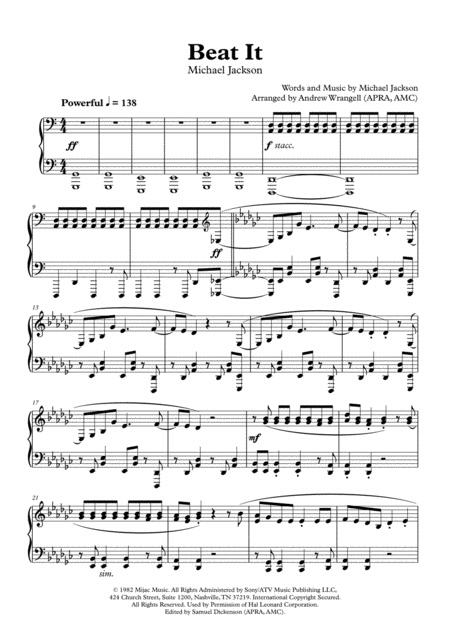 This arrangement by Andrew Wrangell is approximately grade 8 level. 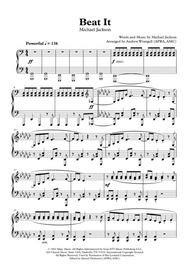 It's a great song and sure to be a fantastic repertoire choice at a concert given how popular it is! Practice hard to nail that incredible guitar solo section!